• Audio Commentary with Director Tim Story, Producers George Tillman Jr. and Robert Teitel and Writer Don Scott Jr.
First known as a member of pioneering rap group NWA, Ice Cube burst onto the cinematic scene in 1991 via John Singleton’s Boyz N The Hood. Nearly 30 years later, Cube may be better known as an actor than a musician, a trend abetted by hits like 2002’s Barbershop. The story introduces us to Calvin Palmer (Ice Cube), proprietor of a barbershop in Chicago’s inner city. Many generations of Palmers ran this business, but Calvin encounters financial problems and can’t pay the shop’s debts. Due to this, Calvin agrees to sell the barbershop to local loan shark Lester Wallace (Keith David). However, Calvin regrets this decision and acts to reverse his choice without too many negative ramifications. Being a dialogue-driven comedy and an ensemble one at that, we spend a good amount of time in the film’s titular business and follow many of the characters that make up the assembly. Best of all is Eddie (Cedric the Entertainer), a holdover from the days when Calvin’s dad owned the shop. Eddie seemingly has no customers and spends all day barking out his unpopular and bristly opinions to everyone in the shop. Eddie has an opinion about every hot-button topic dealing with African-American history and pop culture and he’s not afraid to relate these thoughts. While these remarks create some pretty volatile conversations, they’re also good for a lot of laughs. Cedric fills out the role in a fun manner that adds to the mirth. 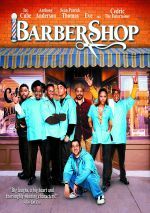 Barbershop seems amusing as a whole and contains many bits that work to perfection, though I feel a couple of side stories become poorly executed. In the end however, Barbershop manages to entertain and turns into a pleasurable 102-minute ride. Barbershop can hang its hat on its performances, especially those turned in by Ice Cube and Cedric the Entertainer. Both do wonders in making the film an enjoyable romp inside of this inner city sanctuary and give turns that contain an affable depth and emotion not often found in the genre. Ultimately, the film delivers a diamond in the rough and a nice find for those of us that missed it during its theatrical run. This Barbershop is a cool place to hang out … sit back, kick up your feet, and enjoy yourself. Barbershop appears in an aspect ratio of approximately 1.85:1 on this Blu-ray Disc. This became an erratic but largely good image. For the most part, sharpness satisfied. Some interiors came across as a little on the soft side, but most of the movie brought nice clarity and delineation. No jagged edges occurred, and shimmering remained minimal. Though I saw no edge haloes, print flaws cropped up occasionally. These stayed modest but they created some distractions. In terms of palette, Barbershop went with a warm, earthy feel. The image allowed the hues to stand out as lively and full. Blacks seemed dark and dense, while shadows seemed well-rendered much of the time. Again, interiors could be a bit thick, but these elements usually satisfied. I flip-flopped between “B-“ and “C+” but figured the strengths worked well enough for the higher grade. A character-oriented comedy, Barbershop went with a pretty low-key DTS-HD MA 5.1 soundscape. The information focused heavily on the front channels, where we got good stereo music and occasional effects material. Don’t expect a whole lot from the latter domain, though. Much off the information stayed in the ambient realm, and that meant a subdued soundfield. That wasn’t a bad thing, though, as this story didn’t require a broad mix. Audio quality appeared fine, with music that sounded pretty lively and full. Effects didn’t have much to do, but they seemed accurate enough and lacked distortion. Though speech always stayed intelligible, a little edginess occasionally interfered. However, this never became a real concern. This turned into an acceptable soundtrack. When we head to extras, we open with an audio commentary from director Tim Story, writer Don Scott Jr., producers George Tillman Jr. and Robert Teitel. All four sit together for a running, screen-specific look at story/characters, cast and performances, sets and locations, cinematography and editing, music, editing, and related domains. Expect a pretty engaging track here. The participants keep up a good level of energy and interact in a casual, fun manner, factors that help turn this into a fairly informative discussion. Under The Hair Club, we find four different related featurettes: “The Final Cut” (19:27), “Set, Press and Style” (6:04), “Finishing Touches” (5:59) and “Hairdos and Don’ts” (7:01). Across these, we hear from Story, Teitel, Tillman, Scott, writer/producer Mark Brown, writer Marshall Todd, production designer Roger Fortune, costume designer Devon Patterson, and actors Ice Cube, Anthony Anderson, Cedric the Entertainer, Sean Patrick Thomas, Leonard Earl Howze, Michael Ealy, Eve, Troy Garity, Lahmard Tate, and Jazsmin Lewis. Also, a variety of unnamed barbers appear in “Don’ts”. In these, we learn of the movie’s origins and development, story/characters, cast and performances, sets, locations and production design, Story’s work as director, costumes, and various hairstyles. Most work well and give us good information, though “Don’ts” seems less than enthralling. An Easter egg on the original DVD, Barber Banter runs two minutes, 39 seconds and includes notes from Thomas, Story, Cedric, Tillman, and those unnamed barbers. They discuss crazy comments made in barbershops and turn this into a brief but fun clip. Seven Deleted Scenes fill a total of six minutes, 42 seconds. These tend to either bring us minor character information or exposition. None of them seem memorable, but they add some mildly interesting moments. We can watch the scenes with or without commentary from Story. He gives us basics about the sequences and tells us why he cut them. Story delivers useful information. A compilation of Bloopers and Outtakes takes up four minutes, 53 seconds. It shows some of the usual goofs and giggles but it also throws in some alternate lines, and those add humor. Next comes a music video for “Trade It All” from Fabolous Featuring P. Diddy and Jagged Edge. The video mixes movie clips with footage of hot women and some unique material with a few film actors. It’s not a great video but the presence of Cedric and Cube adds some fun. A Photo Gallery follows. It offers a running one-minute, 56-second reel with 35 images from the set and the movie. Some decent shots occur, but no one upgraded the presentation from the DVD, so it looks pretty ugly. The disc concludes with ads. We find trailers for Barbershop, Barbershop 2, Beauty Shop, Chokeslam, Crazy Six, Out of Time, Walking Tall and Windrider. An entertaining character comedy, Barbershop works pretty well. A good cast adds to the experience and makes it a likable ride. The Blu-ray brings generally appealing picture and audio along with a better than average set of supplements. Barbershop works as a movie, even if the Blu-ray could use an upgraded transfer.